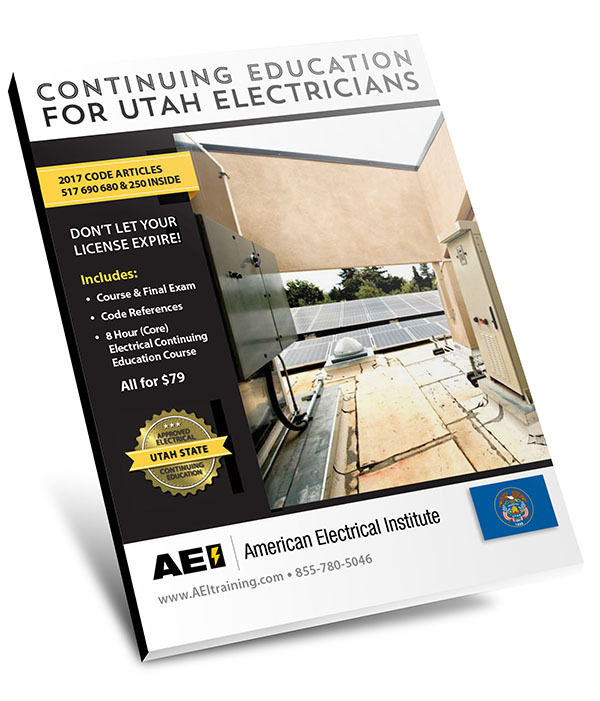 The Utah Department of Commerce Division of Occupational & Professional Licensing (DOPL) requires Utah electricians to complete 16 hours of continuing education to renew your license. Our 16 hour packages below will fully satisfy your continuing education requirements. You can view our state approval at http://www.utah.gov/ce-public/. Select “American Electrical Institute” from the Provider Name drop down menu. The renewal deadline is November 30th, every two years. The next renewal period is November 30, 2018. Click on the “Start the Course” button above to begin your course immediately. If you don’t finish the course and you need to come back and pick up where you left off, just click on the “Resume a Saved Course” button above. Once you complete the course, click on the “Add to Cart” button above to purchase the course. We will then email your certificate of completion (within 1 business day) and report hour hours to the Utah Department of Occupational & Professional Licensing. You may have already received our book in the mail. If you would like to purchase online and then email or fax us your answer sheet, click the ADD TO CART button below. If you did not receive our book, you can request one here. Once you purchase the course you will need to email us your answer sheets. Our email is electricalceu@gmail.com. You can also fax the answer sheets to 888-246-9280. Do you report my hours to the state of Utah? Yes, we report all continuing education results to the Utah Department of Occupational and Professional Licensing division on a daily basis (not weekends). I have my answer sheet from the book that you mailed me all filled out. What do I do next? You need to pay for the course by using the “BUY NOW” buttons above. You can also call us at 855-780-5046 and we can take your credit card information over the phone. Once you have paid, you can either email us or fax us your answer sheets. It usually takes us 1-2 business days to grade your answer sheets. Yes. Once you complete and pass the continuing education course, we will email you the completion certificate within 1 business day. The certificates of completion are for your records. We will report your hours to the Utah Department of Occupational and Professional Licensing for you. Do you renew my Utah license for me? No. After you complete the continuing education hours, you will need to pay the DOPL the renewal fee, as we cannot do that for you. We only offer online and correspondence continuing education courses in Utah. We do not offer any classroom continuing education courses in Utah. We find that most students prefer to complete their courses on their computer, smartphone or tablet. If I purchase one of your online Utah continuing education packages, can I complete one of the courses now and the other courses during the next renewal? Yes. As long as our courses are active (and not expired), you can complete the courses over multiple renewal periods.